Ted Burke LIKE IT OR NOT: "Forever Changes" was released 50 years ago! "Forever Changes" was released 50 years ago! I I caught wind that 2017 is the 50th anniversary of the release of Love's seminal record Forever Changes, an occasion that I couldn't let pass without a tribute listen to the revered 1967 album. I was mesmerized all over again by range of materials—acidic rock guitar, marching rhythms, sad Mariachi horn sorties and Spanish guitar and tango beats, lush arrangements, MOR pop jazz and the skill to write the private lyric that drew the listener closer to the speaker to hear the words, but which denied a comforting assurance. An album full of wide roads, sharp terms, idyllic optimism, there were menacing undercurrents, under the fleeting elegance. It was as if vocalist and principle songwriter Arthur Lee absorbed every note of music, from every style that poured from Los Angeles radio, blending them will, providing a true, original thing, something no one had heard before. It remains a fascinating and dramatic document; it’s damn good music. The way this disc moves from one mood to the next, quickly but not jarringly, from upbeat, dance-happy jazz to the serene yet melancholic textures, shades and tonalities the orchestrations create as they play over the solid rock band base, remains amazing and, I think, unequaled. The Beatles were antecedents, of course, in the employ of diverse musical styles in their songs and mixing those up in ways rock and roll songwriters hadn't imagined up to that time. But a major element of Lee's and Love's success in diving headlong into the choppy eclecticism is their avoiding the limitless disasters of others who attempted their own versions of Sgt Pepper. Naturally, not all on Forever Changes has aged well. Lee’s lyrics sometimes become a murmuring stream of hippie Know-Nothingism. The guitar solos, though brief, likewise cringe-inducing, atonal fuzz tone blasts that sour these albums’ otherwise sublime arrangements. Where were Hendrix and Clapton when you needed their savvy on the frets? As the melody charges, segues into a stirring horn solo and again fades off and then builds momentum again, we have the genius of the album, a mix of insight and naiveté trying to balance them out, contained in a gorgeous, simple framework. Arthur Lee’s best writing was about the battle of a man trying to bring clarity to the many sensations his senses brought him. The albums last tune, Lee’s masterpiece, is “You Set the Scene” a fascinating stitchery of the kind of rush discotheque pulse where everything is noticed, and reality becomes a druggy collage. Details are word fragments, phrases and images do not follow each other in logical order; it is as good a description of an acid trip as I’ve listened to. The trippy pulse of the of the first section segues into the steady, marching stride of the second portion. Horns blare a hearkening fanfare, drums kick in with a steady, even gait, and the narrator seems to have become a man who has crashed from his high after a vision and now allows his eyes to scour the hillsides and valleys and consider, finally, the kind of future he’d to live in. Yes, I realize these smacks of the old counterculture conceit, the young man, smitten with The Truth, saying farewell to parents and old friends to become genuinely authentic. But Lee’s imagination prevents this from becoming a preposterous demonstration. Lee’s voice soars, croons, quivers, strains effectively on high notes, floating with confidence over the increasingly dynamic horn arrangement. This is a march into the future; it astonishes me how magnificent this music still sounds fifty years on. 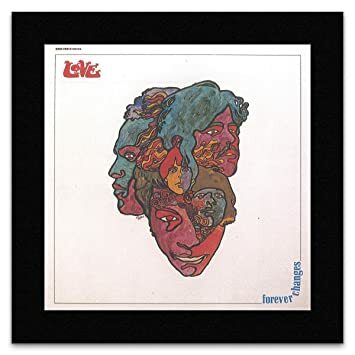 Forever Changes, Love's third album, is considered by many to be the best American response to the Beatles bar-raising disc Sgt.Pepper's Lonely Hearts Club Band. As is too often the case, Lee’s greatest creative period was short-lived; drugs, jail, eccentricity and erratic behavior prevented him from regaining the heights he reached with Forever Changes.